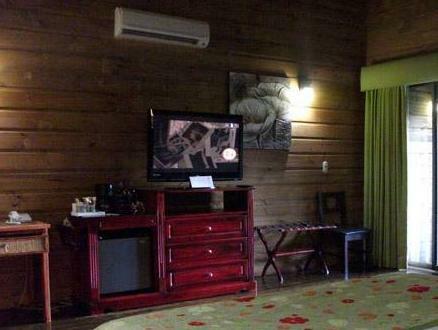 ﻿ Best Price on Baldi Hot Springs Hotel & Spa in La Fortuna + Reviews! Just 1.6 mi from the Arenal Volcano, the Baldi Hot Springs Hotel & Spa offers 25 thermal pools, waterslides, landscaped gardens, air-conditioned suites, and parking. The stylish suites at the Baldi Hot Springs Hotel feature free Wi-Fi, flat-screen cable TV, a coffee maker and mini-bar. The private bathrooms come with free toiletries, bathrobes and slippers. A free buffet breakfast is included each morning, and you can enjoy international, vegetarian and organic cuisine in the 4 on-site restaurants. There are also 4 bars, including swim-up pool bars. The Baldi’s spa and wellness center uses natural volcanic mineral water, with pools at various temperatures. There is also a hot tub and massage service. Lake Arenal is just a 15-minute drive from the hotel, while San José International Airport is 2.5 hours away. Please note that Credit Card is only for guarantee purposes. Payment before arrival via bank transfer is required, the property will contact you after you book to provide instructions. Guest must provide a warranty for room charges, so it could be a guarantee by credit card or cash. The guarantee deposit is a hold, not a charge on your credit card, minimum deposit required is US$150. The rates for December 31 include dinner for 2 adults, and there is an additional charge for an extra adult person of $153 and per child of $81 including breakfast, special dinner, lodging and taxes. This will be charged by the hotel at the time of making the reservation.